Set an interest in the garden with this lovely garden Angel Bird Feeder holding out a shell as a bird feeder or bird bath. She is made of resin and comes beautifully detailed and hand finished in color as shown. 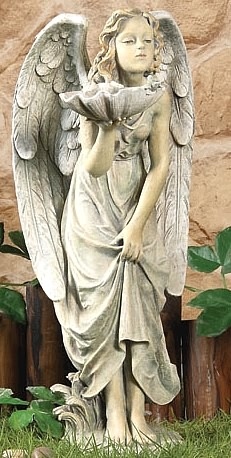 A little angel girl curtseys gracefully in this lovely angel girl bird feeder statue for the garden.